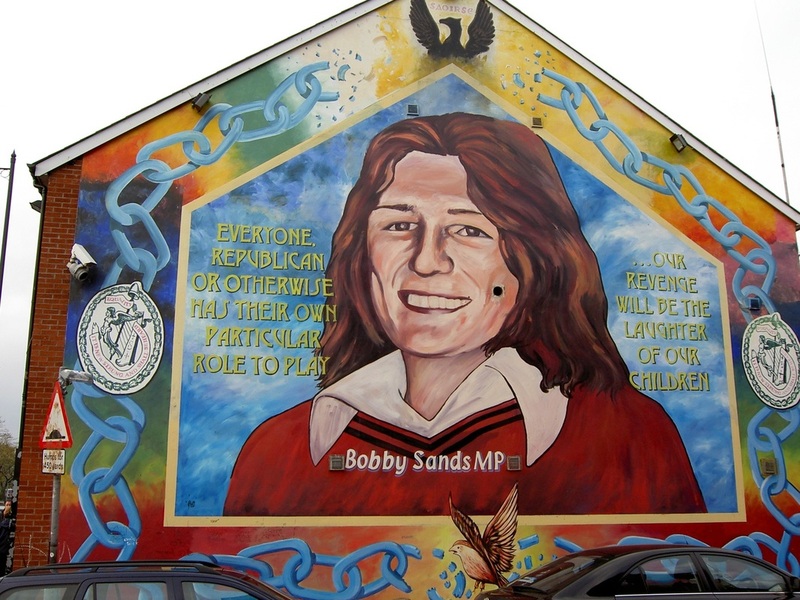 Following the hunger strike, nationalist murals depicting those considered martyrs of the hungerstrike, such as Bobby Sands began to appear, relying on images and iconography developed by prisoners who hand crafted works of art and decorated their cells with murals and painting. Over one hundred murals were painted in 1981 by Catholic youth, with the lark in barbed wire as the most common secular symbolic image, due largely to Sands's use of the lark in his writings and as a pseudonym. Other popular images included the H representing H-block, crosses and flags, with secular images predominating, many with mottos and poems, and many murals were copies of photographs, such as the firing squad at Bobby Sands funeral service. 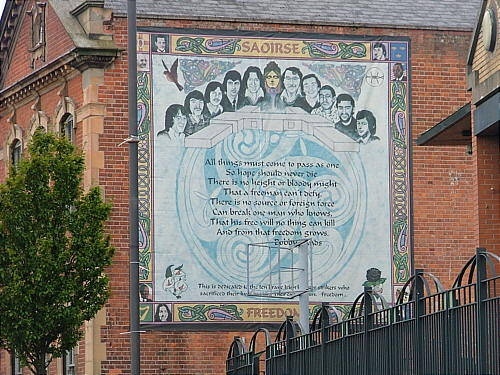 The People's Gallery is an area in the Bogside area of Derry, where a trio of artists known as the Bogside Artists have created a series of murals depicting events during the Troubles. The Raymond McCartney mural on Rossville street, Bogside, is dedicated to "The H Block & Armagh Prison Struggle And In Memory Of Bobby Sands, Kevin Lynch, Frank Hughes, Kieron Doherty, Raymond McCreesh, Tom McElwee, Patsy O'Hare, Michael Devine, Martin Hurson, Joe McDonnell." This mural depicts Raymond McCarney along side a woman who suffered during the hunger strike. In black and white, the man resembles Christ, and recalls both Christ's suffering at the hands of babarians and his fasting in the desert. A mural depicting Bobby Sands still exists on the gable end of the headquarters building of Sinn Féin, on the Falls Road in Belfast. In the Ardoyne area of Belfast, a street mural dedicated to the 1981 hunger strikers on the 25th anniversary of Martin Hurson's death. 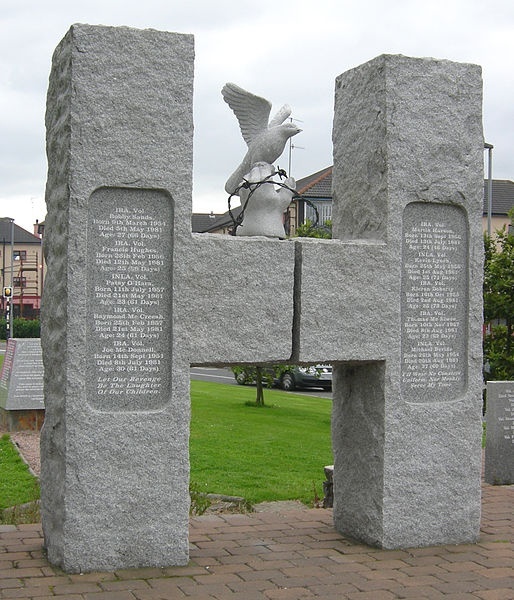 H-Block Monument in the Free Derry area of the Bogside, Derry; in memory of the hunger strikers in the H-Block of Long Kesh prison in 1981. Adorning the walls of the Carnegie Library in the Falls Road are the portraits honoring the ten dead hunger strikers of 1981 - Bobby Sands (IRA), Francis Hughes (IRA), Raymond McCreesh (IRA), Patsy O’Hara (INLA), Joe McDonnell (IRA), Martin Hurson (IRA), Kevin Lynch (INLA), Kieran Doherty (IRA), Thomas McElwee (IRA), Michael Devine (INLA). They are placed alongside a warrior from the Fianna, Martin Luther King, Mahatma Gandhi and Nelson Mandela.